This article introduces a “dot.line-” scene using Playmaker. 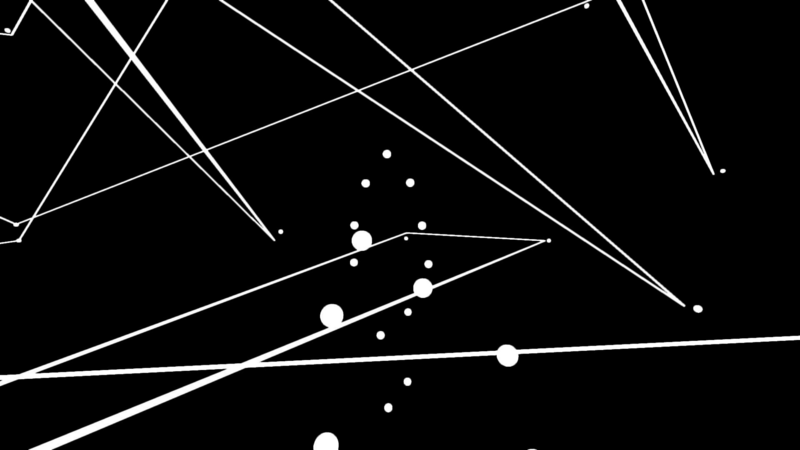 “dot.line-” is a simple VR space that is made from only dots and lines in black and white. 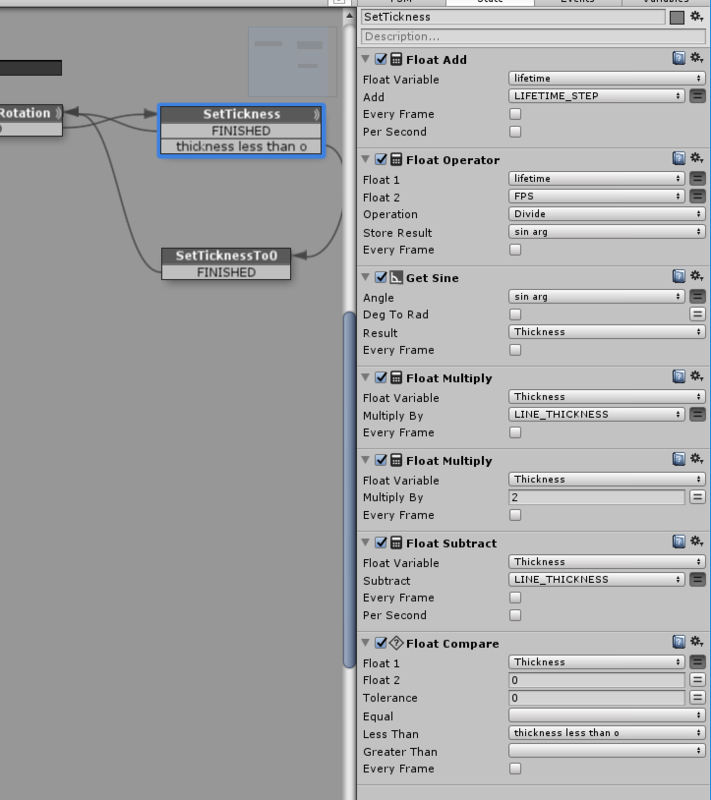 Setting the movement to random results in a fresh experience each time you start the scene. This article mainly talks about the implementation of the Playmaker used in this scene. This UnityProject has been published in GitHub. Please refer to it from here. 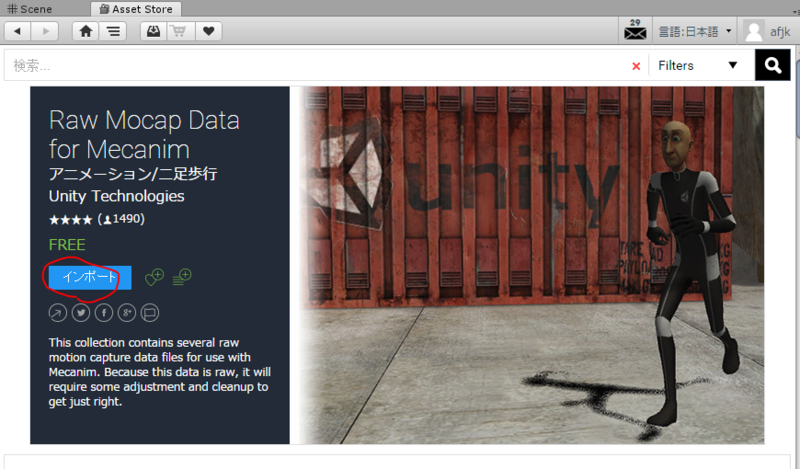 First of all, you need to download the zip file or clone the STYLY-Unity-Examples repository from GitHub. 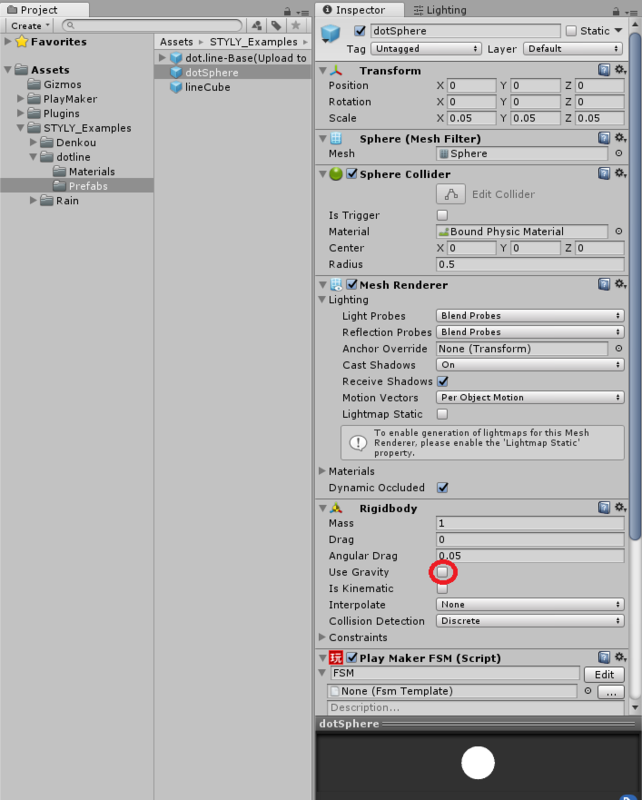 Open the project in Unity 2017.4.x, and import Playmaker(Purchase needed). Assets>STYLY_Examples>dotline>dotline and press the play button. The dot.line- scene will run. ※ This UnityProject does not include dot.man. The balls in the scene jump around in zero gravity, and are surrounded by an invisible box. Surround the ball by a Cube, set BoxCollider, and set the scale for each side to 10, thickness to 1. 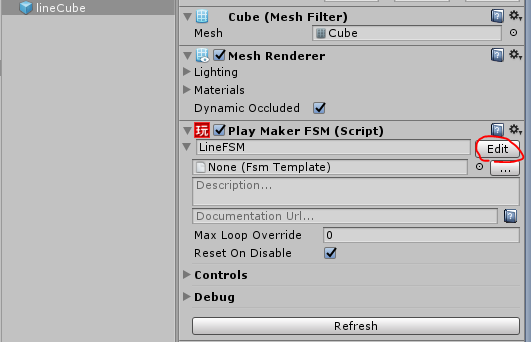 Set the MeshRenderer to non-active, so the Cube will not be displayed. Make a Prefab for a Sphere, then add SphereCollider to it. 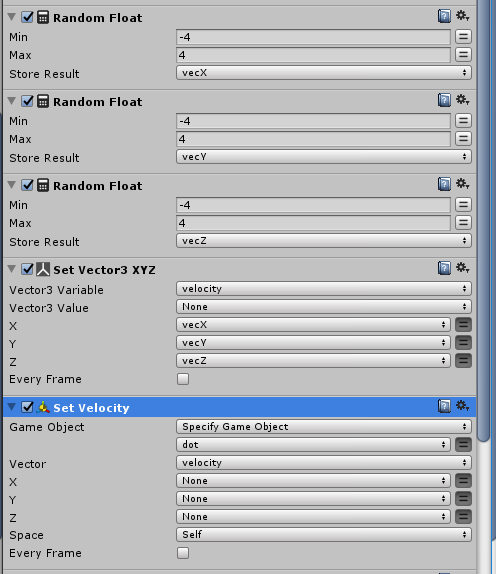 Next, add RigidBody, and unselect UseGravity to make the sphere unaffected from gravity. In order to stop the ball from losing speed when it collides into the Cube, make a PhysicsMaterial, set the Dynamic Friction to 0, Bounciness to 1, and add it to the colliders of the sphere and the cube. 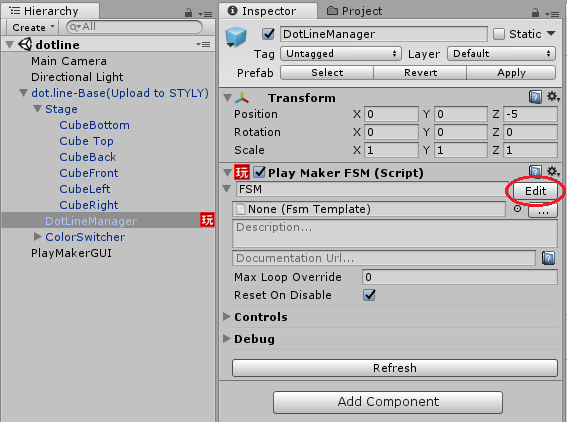 The object creations at the execution of the scene is controlled by the PlaymakerFSM of DotLineManager. Check the Playmaker Editor for details. The creation, arrangement, and initial speed setting of 50 balls is set at the GenerateDots state, which is called upon execution. 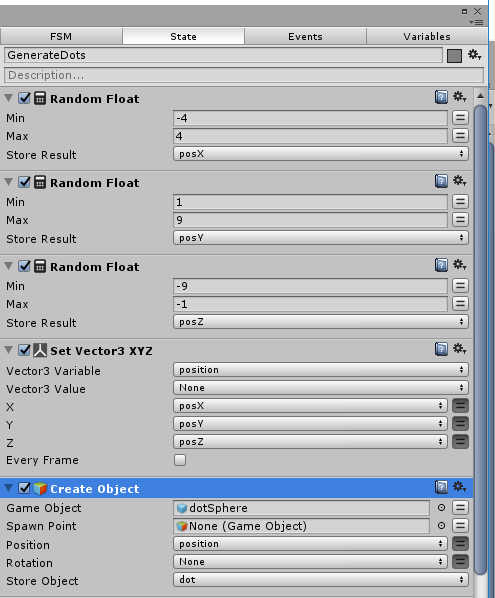 This Action creates a dotSphere prefab, and sets Position at random. 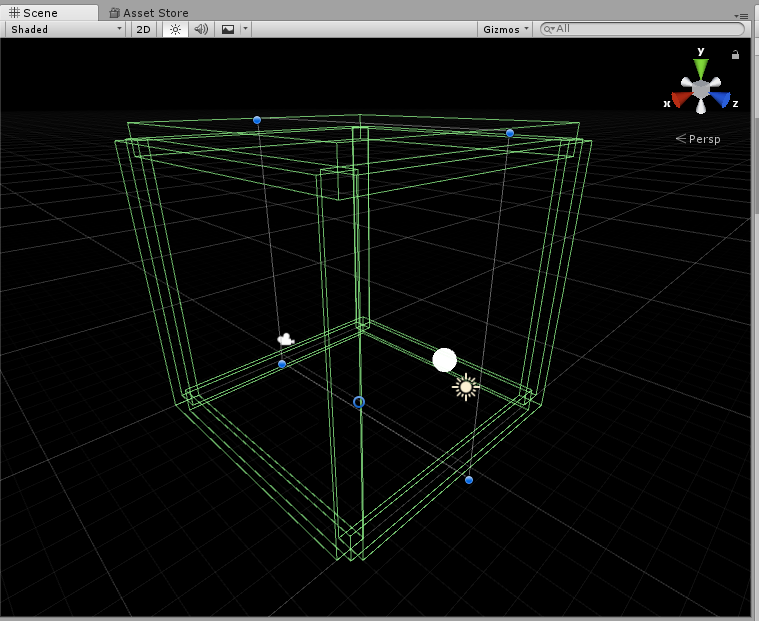 Make random numbers by Random Float, and use them to set a Position inside the cube for the created dotSphere. Randomly create a initial vector in the range -4 to 4, and set the initial velocity at SetVelocity. 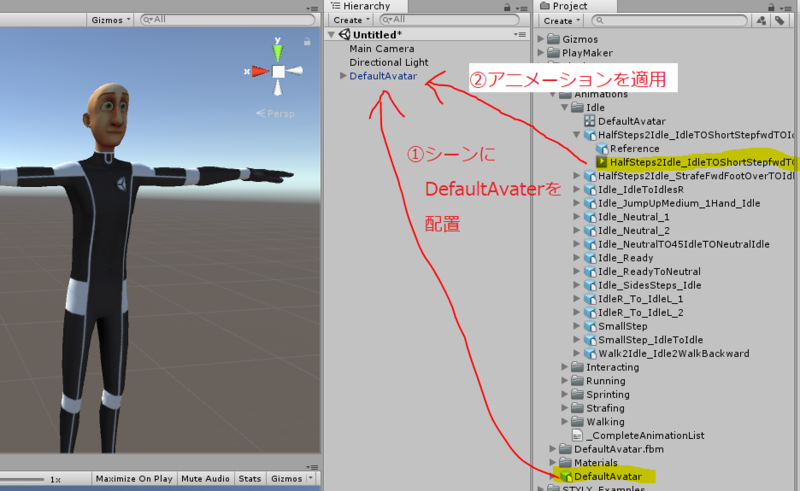 The GameObject of the created dotSphere is needed for future reference, so add it to the array “dotarray”. 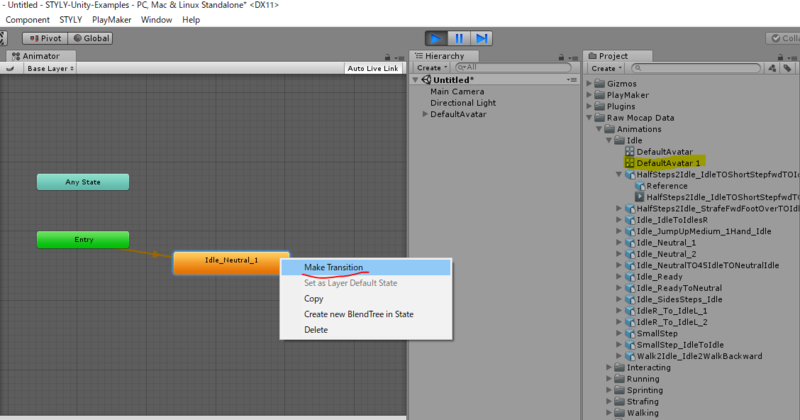 The created GameObject has to be set as a child of DotLineManager, so that it will be deleted when the scene is stopped. 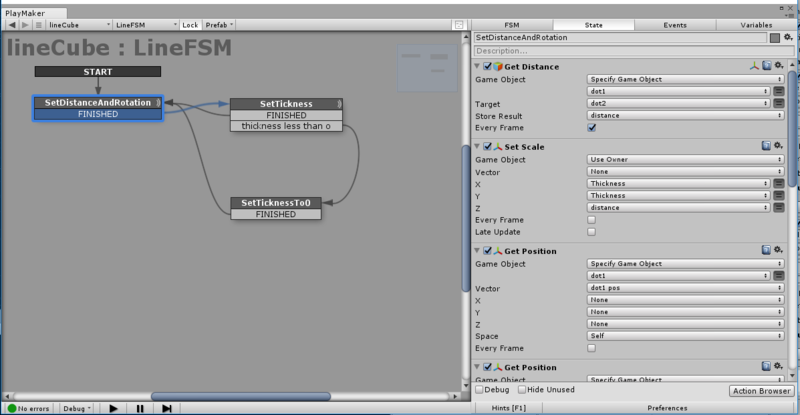 You can get the GameObject(DotLineManager) that uses this FSM at GetOwner, and you can set it as the parent at SetParent. When the GenerateDots status reaches the FINISHED event, it transitions to the same state again, and repeats the ball creation process. a FinishGenerate event is issued, and the state transitions to the next “GenerateLines” state. 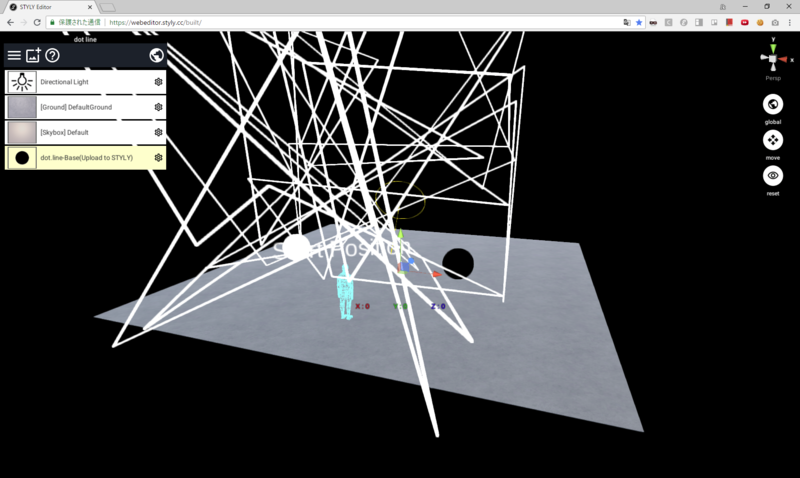 The lines that connect spheres are made by placing a Cube between them, and transforming them. At GenerateLines state, 50 Cubes that connect a sphere with another sphere are created. 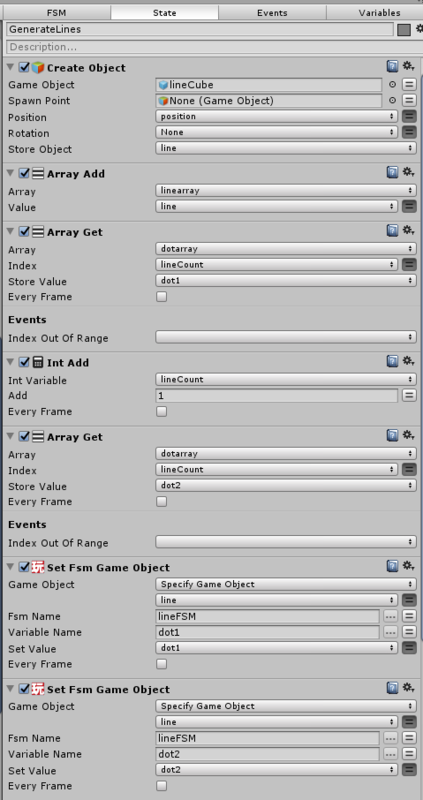 I will explain the actions to create a LineCube, and add it to the array “linearray”. 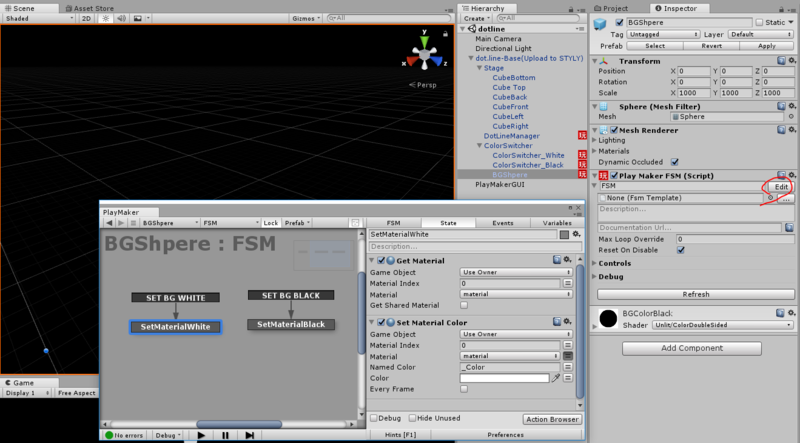 Take 2 spheres from the dotarray, and set them as Fsm Game Objects for the created LineCube. Repeat the creation process until 50 lineCubes are created, and when finished, change to End status. ※ The detection of the repeat process and end process is the same as GenerateDots. At the End process, connect the last created LineCube with the first sphere and the last sphere in dotarray, so that all the spheres become connected like a circle. At the lineFSM of the lineCube, the transform is changed every frame in order to connect dot1 and dot2 with a line. Open the LineFSM of the LineCube. 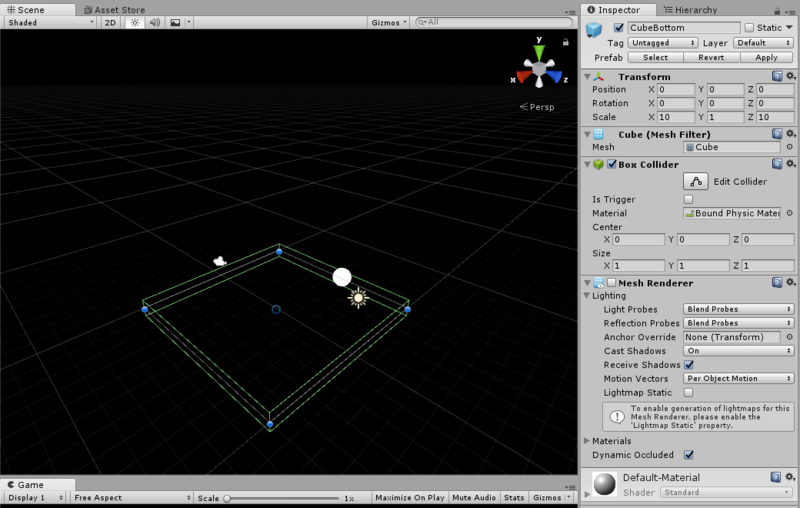 Set the transform so that at SetDistanceAndRotation status, the LineCube connects 2 spheres. Get the distance between dot1 and dot2 using GetDistance, and set it for the Scale. Get the positions of the 2 spheres at Vector3, calculate and set the center position at Vector3 Operator(Add) and Vector3 Operator(Divide 2). Set dot1 as the target for the LookAt option. In order to change the cube’s thickness smoothly, this sample program uses the sin wave shifted 1/4 in the negative direction, and sets 0 for anything under 0. In this sample, the thickness change period is set as 4 seconds, and uses the parameters below. Please adjust each parameter as you prefer. 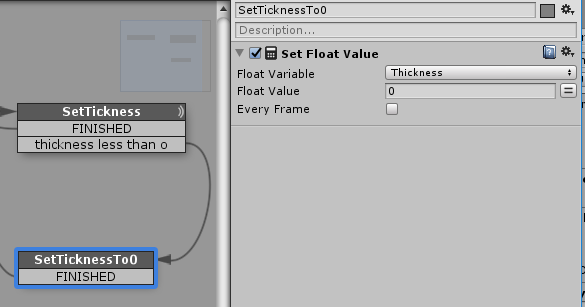 If the thickness is 0 or less, SetThickness is set to 0. Change black and white constantly. ColorSwitcher inflates black spheres and white spheres one after the other, and switches color when it covers the whole screen. 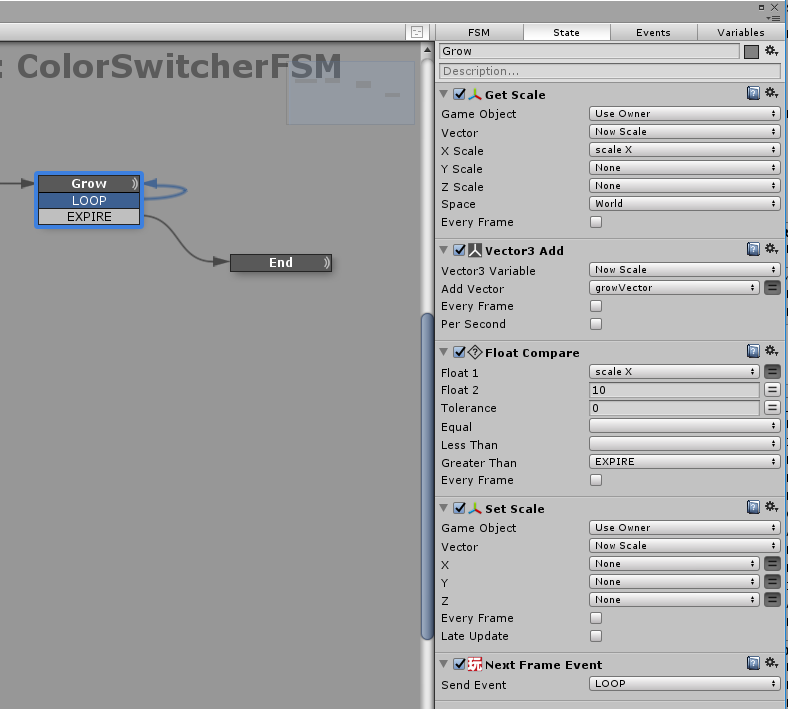 The FSM for ColorSwitcher is set as below. When executed, the scene starts with a black background, and the white ColorSwitcher starts expanding 4 seconds later. At the Grow state, the scale value of ColorSwitcher_White increases every frame, and when the size becomes larger than 10, an EXPIRE event is issued, and the state changes to End. 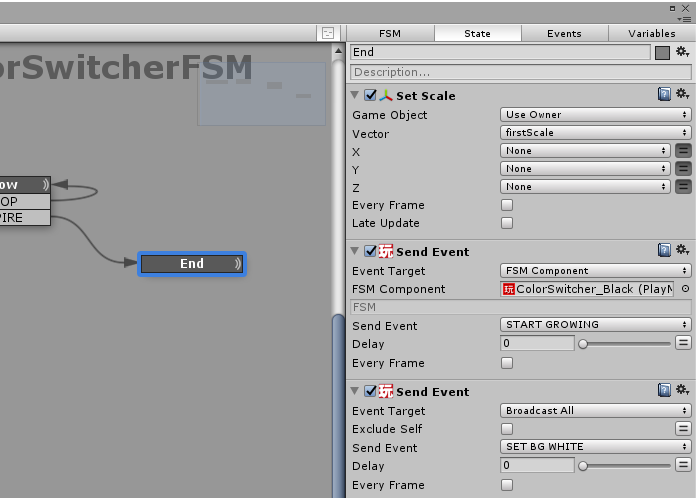 At the End state, in order to give control to ColorSwitcher_Black, a START GROWING event is issued and BroadcastAll issues a SET BG WHITE event to every PlaymakerFSM and notifies the background color has been changed. When the ColorSwitcher_Black recieves the START GROWING event, it enters the Wait state, and the process from there is the same as ColorSwitcher_White. 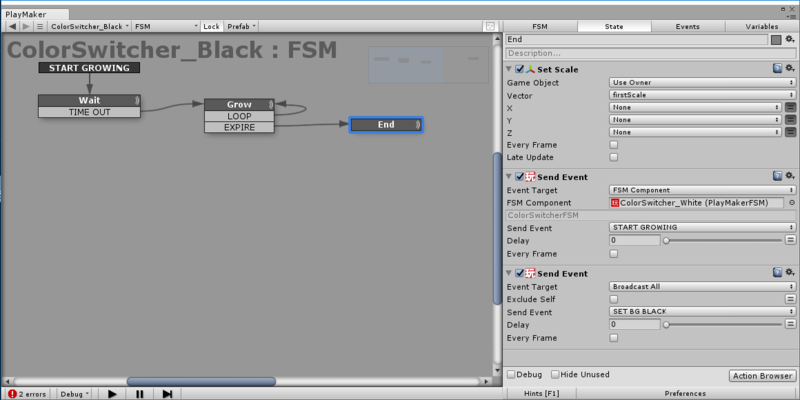 BroadcastAll issues SET BG BLACK event to every PlaymakerFSM and notifies the change of background color. 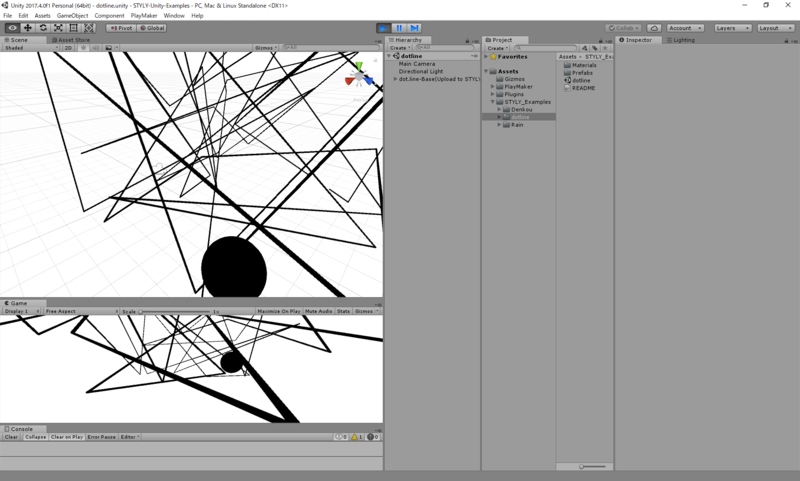 The objects that receives the background change event SET BG WHITE/BLACK are dotSphere, lineCube, and BGSphere. 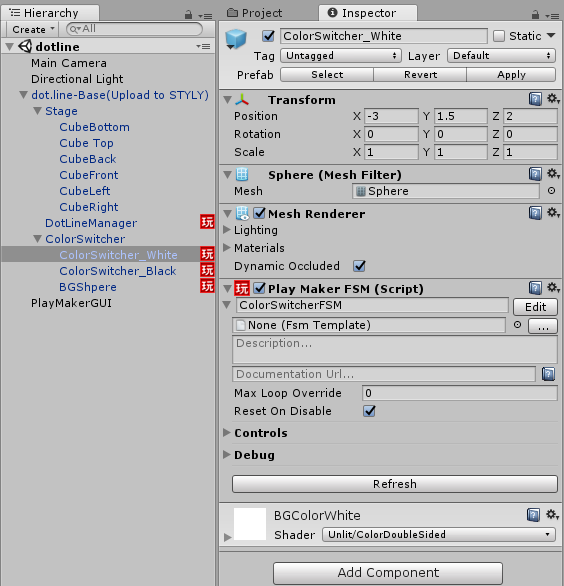 A PlaymakerFSM is added to each object, and when it recieves the event, the object gets its own Material, and changes the color using SetMaterialColor. Finally, I will introduce how to create dot.man. 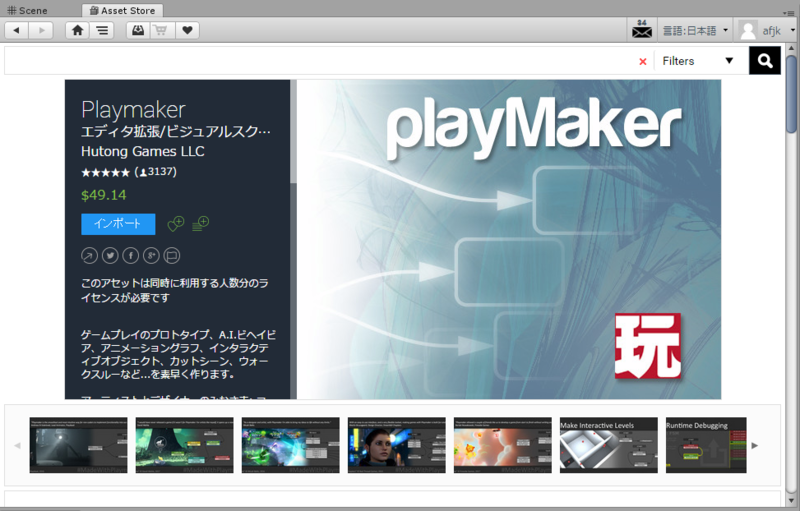 For dot.man, Playmaker is not used, and the movements are set using Animation. 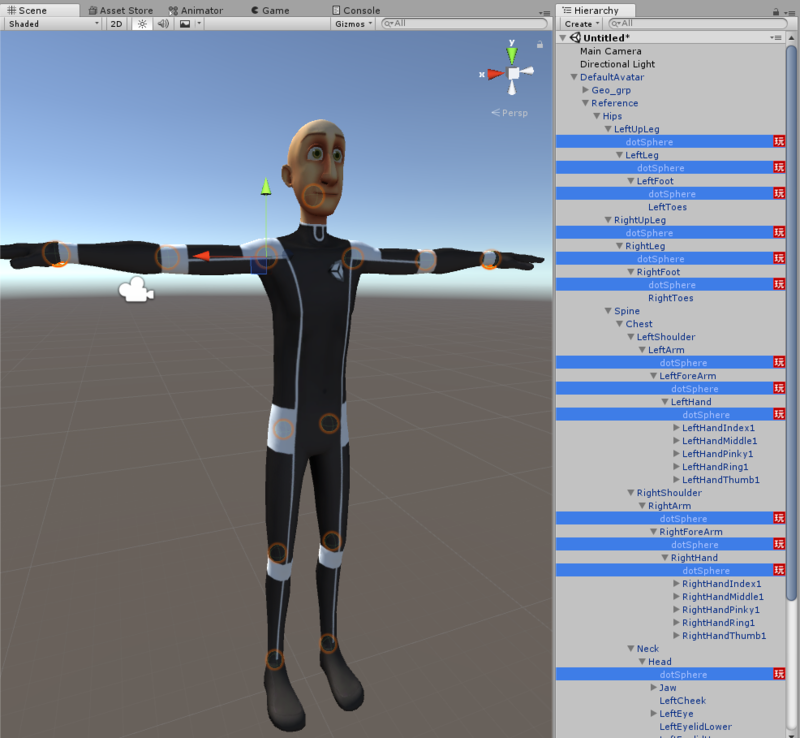 Please obtain the Raw Mocap Data formMecanim asset from the asset store, which will become the base. 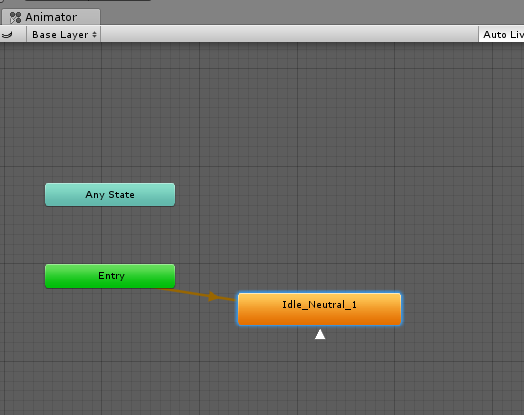 First, place the DefaultAvatar model in the Hierarchy, and set any animation you prefer from the Animations list. 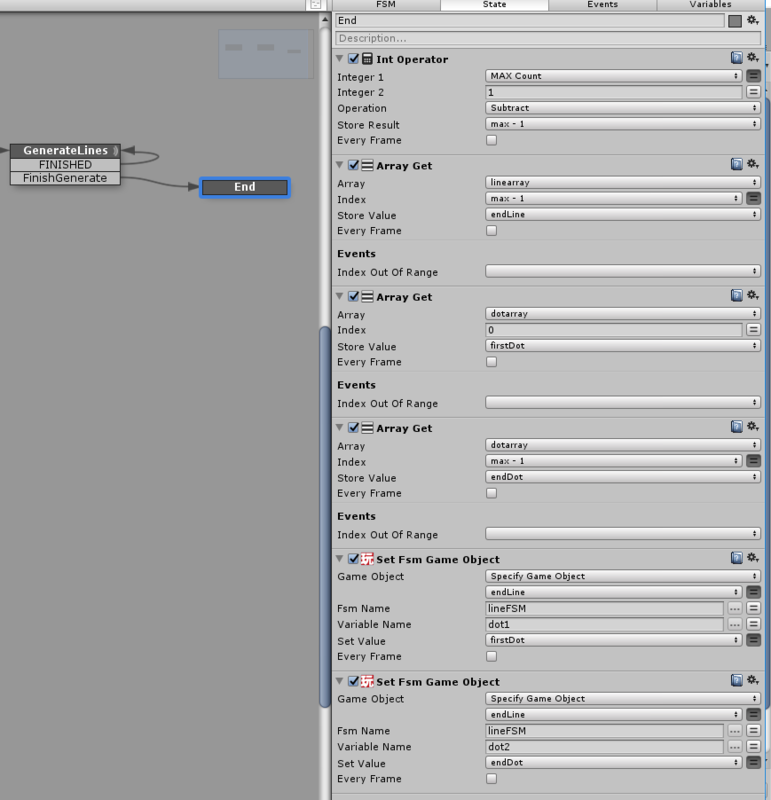 In order to set a loop for the animation, edit the AnimationController. 1. 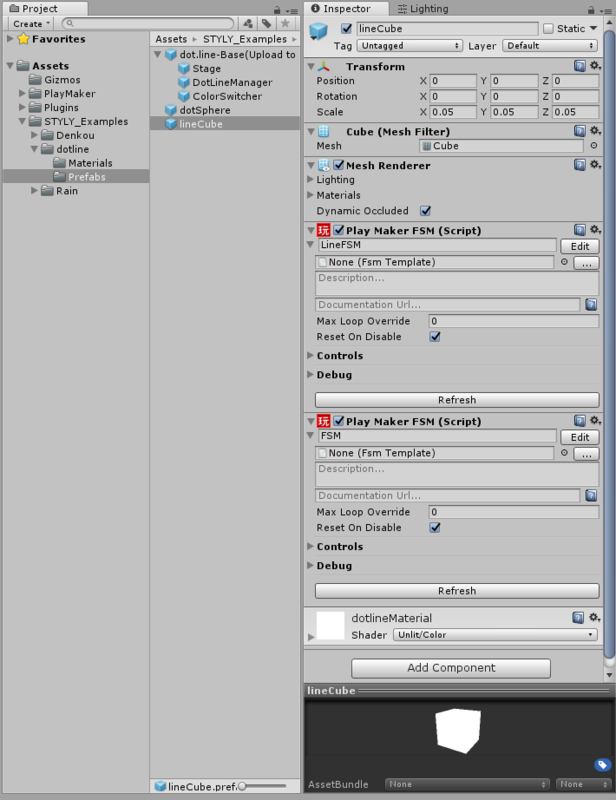 Double click the AnimationController, and open the Animator window. 2. 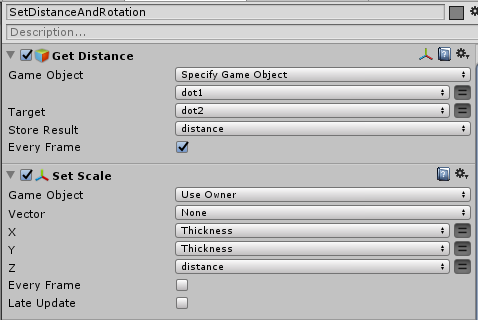 Right click the Animation you added (in the example, “Idle_Neutral_1”), and choose MakeTransition. 3. 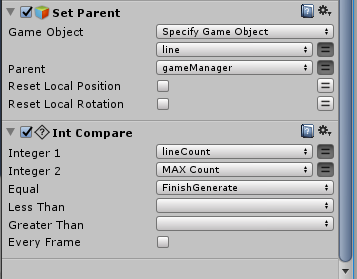 Set the transition target to the same state(Idle_Neutral_1). Click play, and check that the animation is looped. Next, for each joint of the DefaultAvatar, create a dotSphere beneath them. 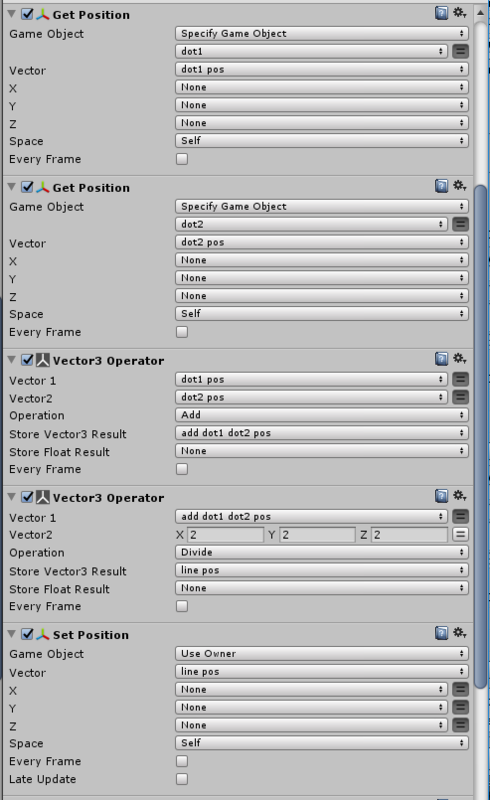 Finally, change the mesh of the Geo_grp, LeftEye, and RightEye gameObject to non-active, and “dot.man” setting is done! Try moving the model in different animations. 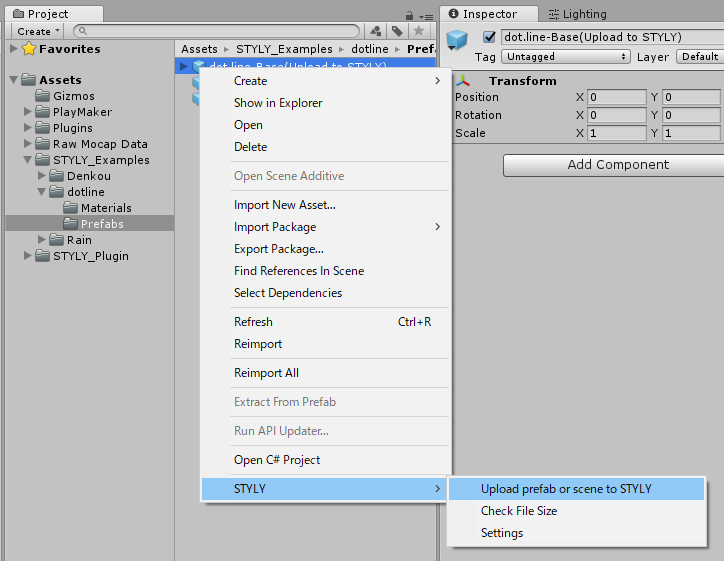 Download and import the UnityPlugin from the STYLY Download site. ※ Please check the details for the initial setup settings at the download site. After some time, the Upload Success popup will show up. 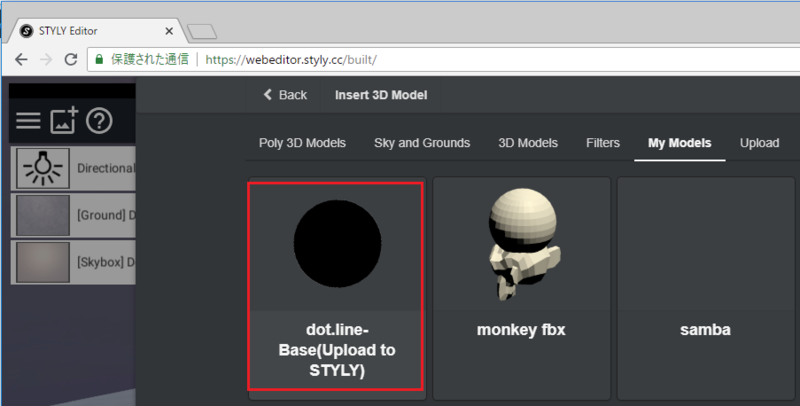 Open the STYLY editor and in choose asset, open the 3D Model > My Models tab. The uploaded asset will be located here. Click it the place it in the scene. Using the same process, make a prefab from dot.man and upload it too. That will be all for the introduction for dot.line-. By using Playmaker in STYLY, you will become able to do many new things, and your range of expression will expand tremendously. You can check the dot.line- scene at STYLY from this URL. There is also a 360-degree video uploaded at Youtube, so please check it out too!